I am a professor of Computer Science at Ecole Polytechnique, specialized in Computer Graphics. This involves a balance of research and teaching. In my research, I am developing expressive techniques for the creation of 3D shapes, motions, and animated virtual worlds. I am mostly teaching specialized courses in graphics now, but in the past, I taught programming, algorithms, data-structures and operational research as well. I have been doing this since the beginning of my doctoral studies, almost 30 years ago. I became assistant professor at the Ecole Normale Supérieure (ENS) in Paris in 1991, before moving to Grenoble Institute of Technology in 1993, where I remained for the next 24 years. BS at the ENS, MS and PhD at University Paris XI (Orsay). My first SIGGRAPH was in 1987 (Anaheim), when I was still a master student: I was lucky enough to have my school pay for the trip. I found the conference both very impressive and really inspiring! Then I gave a talk in a course in 1991 and presented my first Siggraph paper in 1993. I have many… One of my best experience was when we managed to make conference attendees more creative and gave them an opportunity to meet outside of their usual circle, by creating a new programme called "Speed Lab" at Siggraph 2008, together with Adam Finkelstein. Adam and I had just met at the general jury meeting (where courses and talks are selected), where we decided to attempt this experience. We gathered volunteering participants the first day of the conference, sorted them into teams with an even number of senior faculty, younger people and students, and gave them a scientific question to solve during the week. The last day, each team had to present their solution, and the best one received an award. This was really fun! Others from my favorite memories come from an event which occurs every year at Siggraph, thanks to Sylvain Paris from Adobe: An informal gathering called "Mousse francophone". We just meet for a few hours and chat in French with whoever wants to join. This enabled me, over the years, to meet again many of my former colleagues and students, either working in the industry or in research. In addition to the joy of meeting old friends, seing how former students advance in their career is a real pleasure. You may know the new motto of ACM Siggraph: "Enabling everyone to tell their stories". My project is related to this. For the last few years, many of us tried to make 3D creation tools accessible to the general public as well as easing it for profesional artists. My new project is to extend these expressive modeling techniques to allow direct 3D creation by scientists from other disciplines. These colleagues usually have strong mental images of their object of study, but no easy way to represent it in 3D, see it moving and deforming, progressively refine their hypotheses and share their visions with others. Enabling them to convey what they imagine – was it static or animated, as easily as with paper and pen, is one of the projects that motivates me the most right now. I would love to have dinner with Marie Curie, learn about her passion for research and her experience as one of the first women in physics and chemistry. For living people, I would dream of having dinner with the Dalaï-Lama. I think he has so much to teach us about the acceptance of other people and finding practical paths to peace and happiness. From my childhood, I have always been into creating my own things: I probably spent more time singing with my guitar than listening to music, more time drawing or sculpting than walking in art museums and all the presents I ever asked for were more material to create and fabricate things. People may not know that I'm still just the same: The best time for me is still when I am in the creative flow, and the experience is even stronger when I can share it with other people – from singing with friends with voices that magically blend to co-inventing new virtual experiments with my colleagues and students! From Prof. Josiane Serre: A faculty in quantum chemistry, she served as director of the girl part of the ENS where she became a mentor for generations of female students. I learned a lot from my meetings with her: About motivation and involvement in one's own work, about dedication to help and advise others, about the importance of having a network of colleagues and friends to rely on. She was really inspiring and she soon became my main role model. My PhD advisor, Claude Puech, explained me the importance of participating to scientific societies and of attending conferences. He was the one who introduced me to ACM Siggraph. 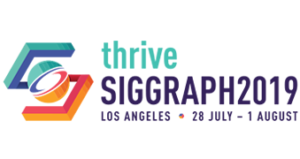 Being the Technical Papers Chair of Siggraph 2017! I was the first one from France to be chosen for the main conference, and, although scared, I was really proud of the confidence the whole research community was showing me. Then, after more than one year of intense work with my advisory board, my committee and the support team, being able to introduce a great program to thousands of people, at the opening of the fast forwards session, was a very rewarding moment.